While John Haas, Stuart resident, was on his boat in the St. Lucie River in March 2011, he noticed a sawfish with an estimated 40 lbs of leader line wrapped around its head, dorsal fins and snout. The 18-foot sawfish swam away after the line was removed, but the same animal was found dead 10 days later from emaciation that was induced from the tightly-wound line. Marine debris, ranging from discarded fishing line to PVC pipe, is extremely detrimental to marine life- especially smalltooth sawfish (Pristis pectinata). This year, there have been two confirmed fatalities of sawfish entangled in marine debris, and approximately 50 reported encounters of entangled, injured, or dead sawfish in south Florida were reported since 1998. Sawfish, a member of the elasmobranch family which includes sharks, skates and rays, are particularly susceptible to entrapment in discarded fishing line due to their elongated snout, or rostrum, which is lined with a row of teeth. This characteristic is advantageous as a tool for swinging through schools of fish in order to incapacitate prey, but it also renders them an easy target for entanglement in discarded nets and other litter. The second sawfish fatality of the year was not due to marine debris, but it was a result of human interaction with coastal ecosystems. 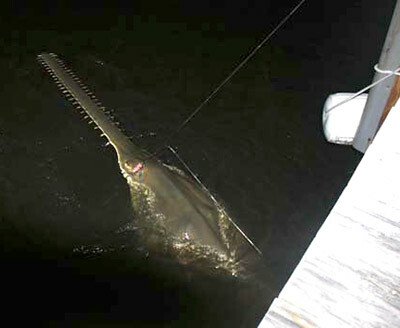 In April, a 14-foot female sawfish was found DOA-its snout was tangled in the stern line of a dinghy docked at Loblolly Marina in Hobe Sound. It is thought to have died due to a lack of oxygen from being suspended above water by the line. According to John Waters, manager of the National Sawfish Encounter Database (NSED), necropsies are standardized procedures that benefit the scientific community and general public. They provide priceless data that is not normally attainable due to the endangered status of the species. Almost every part of the sawfish is kept for data analysis of life history traits to determine, for example, when the species matures or how many pups it has. According to Waters, one scientist is currently studying how to age sawfish based on the size of their rostral teeth. In order to determine cause of death, necropsies were performed on the two individuals. 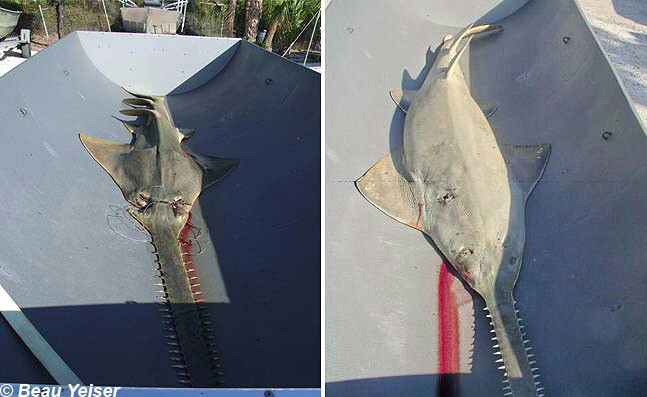 A comparative dissection of the emaciated St. Lucie sawfish to the Loblolly sawfish provided evidence of the toll that marine debris can have on the species. A comparison between an emaciated sawfish (St. Lucie) on the left and an average-sized specimen (Loblolly) on the right. While the emaciated sawfish was just 20 cm shorter than the specimen from Loblolly, its liver weighed almost 17 times less than the Loblolly specimen. The average-sized liver weighed 60 lbs and could not fit in a five-gallon bucket. The liver of the starved individual was less than four pounds and filled one-fourth of the container. Both of the sawfish were mature females, and the difference in oocyte (egg) size shows how reproductive physiology is compromised in starved individuals. The oocytes of the starved individual were about 20 percent of the healthy individual’s size. According to a study of anthropogenic effects on sawfish by Jason Seitz and Gregg Poulakis, fishing line can cause damage to sawfish including the loss of teeth, which is thought to alter the individual’s feeding habits. Fishing or mooring line can also entrap the animal out of the water which makes it difficult or impossible for it to breathe. Other effects of debris include punctured skin causing open wounds susceptible to infection, and in severe cases severed portions of the tail and fins. Even if a sawfish is released from entanglement like the St. Lucie individual, damage that has already occurred can still be fatal. Harmful marine debris is not limited to the discarded line and hooks of fisherman, but also includes plastic bags, bottles, PVC pipe and aluminum cans. Bins provided by the Monofilament Recovery and Recycling Program (sponsored by the Florida Fish and Wildlife Conservation Commission) are designated for disposal of used monofilament lines to help prevent harm to wildlife. Smalltooth sawfish are protected under the Endangered Species Act of 1973 which makes it illegal to harm or harass them in any way. This act was created to help compromised species recover, and with further conservation efforts marine biologists believe this species now has an opportunity to begin to rebuild its population. In addition, the IUCN Red List categorizes smalltooth sawfish as “Critically Endangered”. The Red List states that the principal threat to sawfish is fisheries that catch them as bycatch in nets due to easy entanglement resulting from the pronounced rostrum. Written by MacKenzie Burger and Ashley Hechavarria.